sorry if this is a repost, i looked through the tags and I didn't see this. 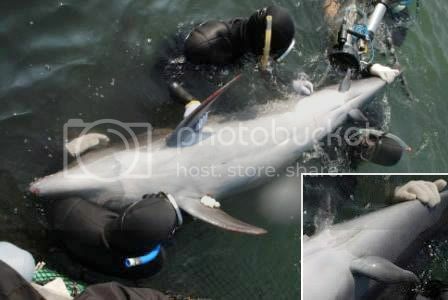 "Japanese fishers have found an unusual bottlenose dolphin with an extra set of fins that could be an evolutionary throwback to the time when the marine mammals' ancient ancestors walked on land." Been following up a few connections after my post about Latrodectus hasselti , the Redback. Also those photos of a Latrodectus catching and eating a snake. Thankyou, wirrrn. This is actually fairly common - I rescued a dugite from a spider web myself, and luckily wasn't bitten by either, unlike the woman who got bitten by both. Dugites, or False Cobras, are potentially deadly Western Australian snakes and ungrateful swine. The Tully Monster - Illinois State Fossil,Tullimonstrum gregarium, an exceptionally odd animal, probably marine, found in the 300-million year old deposits on Mazon Creek. As you can see from the reconstruction above, the Tully Monster had a long tentacle at the front end with a seven-toothed claw, a crossbar half-way down the body with some sort of organ at the ends, and three triangular fins at the tail end. As to what it's related to, your idea is as good as theirs. It might be a holdover from the Burgess Shale organisms, particular the five-eyed Opabinia, or some kind of freakish mollusc, but that's not much help. The Mazon Creek assemblage is a remarkable fossil deposit - in between the coal deposits are layers of shale containing in-situ fossils up to 3 metres long, and millions of siderite concretions that when broken open, reveals fossil plants, insects, molluscs, and much more. Including the Tully Monster, in great numbers. The best bet currently going is that major storms swept sediment from the ocean up into the freshwater swamps, rather like the Mississippi Delta today, promptly burying well-preserved marine, terrestrial (including the earliest known fossil velvet worm), and freshwater organisms in deep silt. See here for Berkeley's informative page about the site and the many organisms discovered there.